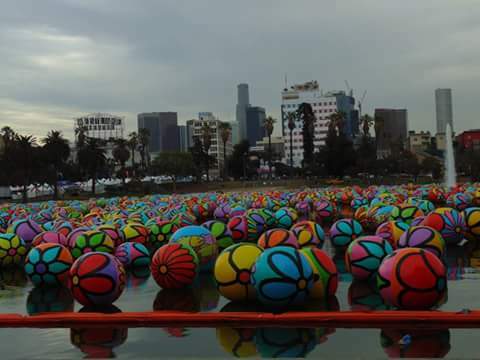 Saturday we went to see the Spheres of Hope art project down at MacArthur Park in downtown LA. 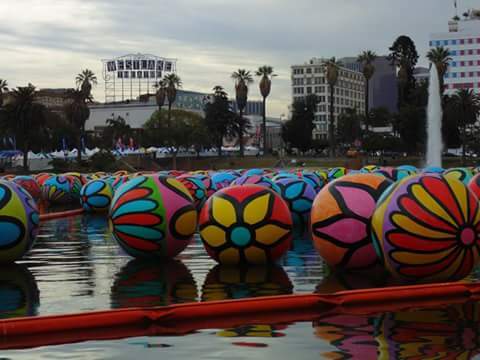 If you have some time on the next weekend or work downtown it is worth the trip over to the Lake to see it. 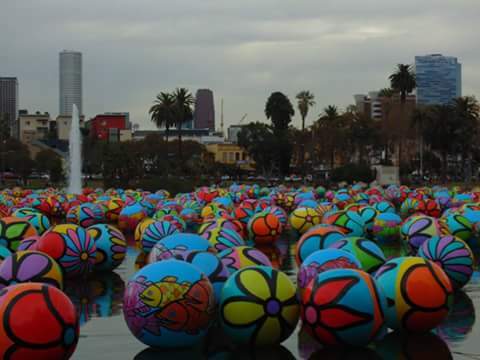 The balls were all painted by kids and it is a glorious explosion of colour in the middle of downtown. The weather was just plain weird though. I was incredibly hot and muggy and just as we had decided it was time to head back to the station it started to rain in huge drops. The rain felt lovely but it made it close to sauna conditions. 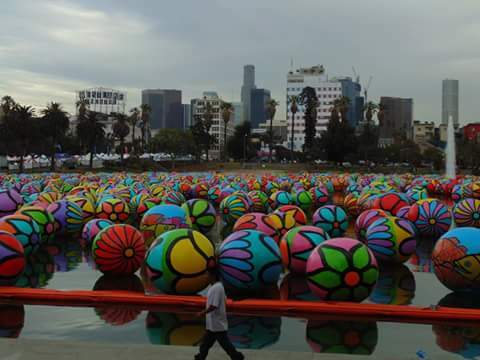 I love to take the subway and the trains around and this was right across from the MacArthur Park Station. 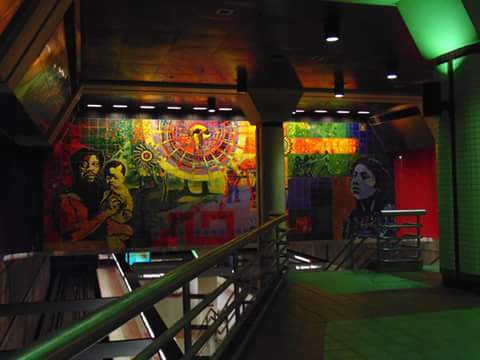 I love to see all the art work that they have placed in the stations and every station is different. Most have painted tile work and they correspond to the history around each station. 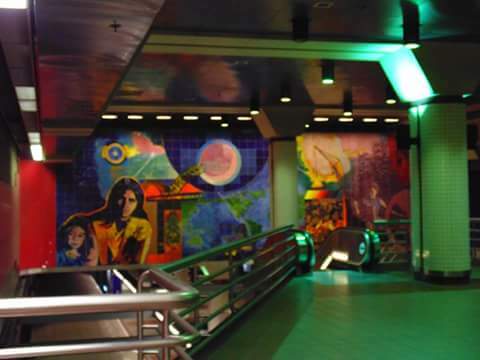 This station has two huge tile murals called El Sol and La Luna and several smaller tile installations of scenes around the park. Our home station has giant round tile murals of things like orange groves and my beloved Amelia Earhart. 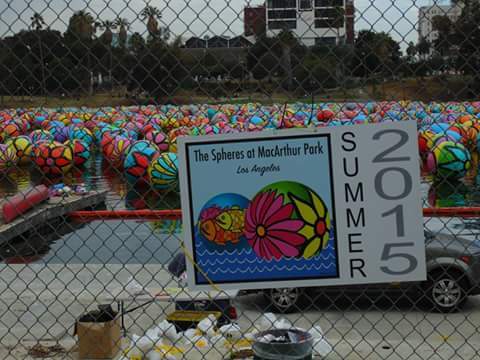 I had never been in the MacArthur Park station so it was adventure to see it and the spheres. The area around the station is a crowded vibrant patchwork of vendors selling all manner of things from food to folk art to cell phone accessories. The area is mostly central American so there is a lot of El Salvadoran and Guatemalan food, stores and art work that dazzle the eye. We had wanted to visit Olvera St and make it a full day out but it was just too hot and my right leg decided to go numb and I couldn’t feel it. It normally only does that if I’m lying down so I didn’t expect it when I was out walking. It feels totally creepy when it happens almost like my flesh doesn’t belong to me so when that happened I just wanted to go home. And it was so hot and swampy it was miserable. My sister wasn’t happy about going home but soon it will be cooler and we can try again. 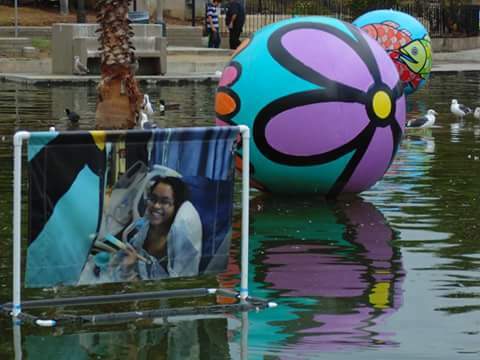 This entry was posted on September 14, 2015, in adventures in photography and tagged adventures, art, macarthur park, spheres of hope, subway. Cool!I can see all 39 and I do not have a single yellow thing in my wardrobe or orange for that matter. Yellow is okay on flowers but not much else. This explains why my mom always made me match her thread and sewing notions colours when she needed them and never sent my brother or sister. My sister insists that one of my canes is silver but it’s baby blue. 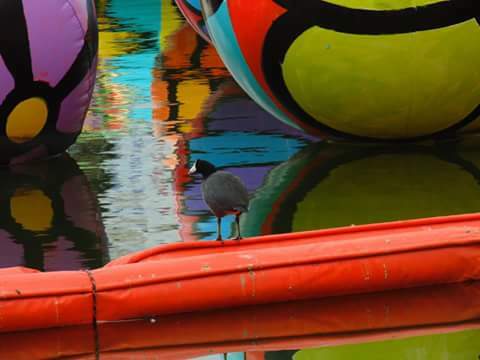 This entry was posted on November 19, 2014, in Uncategorized and tagged art. 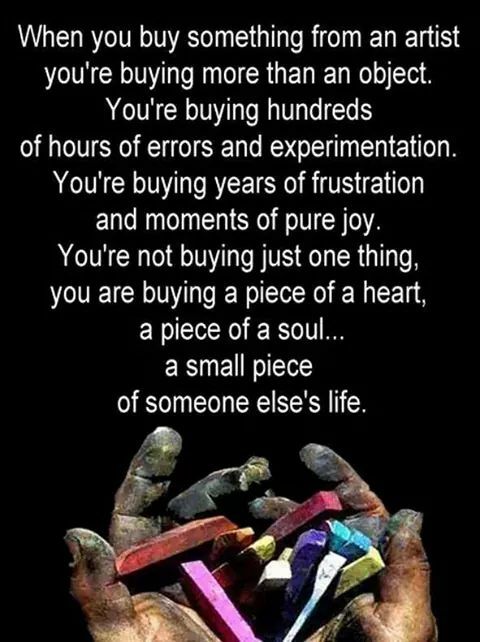 This entry was posted on October 18, 2014, in Uncategorized and tagged art, wisdom. This entry was posted on September 10, 2014, in archeology, architecture, Arts and Crafts, los angeles and tagged art, los angeles.